Load banks are constructed of switched loads, used for electrically loading electric equipments in order generally to test them (batteries, power supplies, UPS, welding power source) such as, typically, the battery discharge test benches. They can as well be used for generating the electrical conditions for testing a specific electrical device (electromechanical relay, breaker, …). They become in this case a production or troubleshooting test bench or part of it. We supply load banks from a few kilowatts to several hundred kilowatts. a set of loads which will absorb the energy taken from the source, the resistive loads being Coudoint products: wirewound, edgewound, woven resistors, optionally linear or rotary, manually driven or motorized rheostats. a control device for selecting the load value, either manually or electronically. An electronically controlled load bank can be fitted either with an embedded PLC or with an electronic interface. They can work in an autonomous way or be driven by an external PC or controller through a direct link or as part as a communication network. 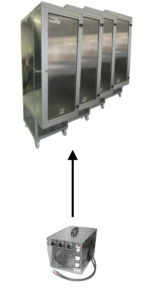 Numerous standard models are proposed in 5 series, see the page Standard load banks. A custom load bank brings often more benefits in all aspects than a poorly adapted standard product.